For the first time in a while, the Brazilian water utility company got some good news. What: Companhia de Saneamento Basico do Estado de Sao Paulo (NYSE:SBS), also known as Sabesp, saw shares climb more than 10% in November thanks to higher-than-expected rainfall in the Sao Paolo region that helped to replenish the water utility's drought-stricken reservoirs. So what: In the past several quarters, Sabesp has been dealing with extreme drought conditions. The low levels of water in the company's freshwater reservoirs led to lower consumption rates and even forced the company to give rate incentives to customers that could reduce their water usage. Thanks to high levels of rainfall in the past couple of months, though, many of the region's reservoirs are replenishing at rapid rates. By Sabesp's estimates, four of the six major reservoirs are now above 60% capacity. If reservoir levels can return to normal in the coming months, it could allow the company to suspend its water usage rate incentives and give a nice boost to revenue. 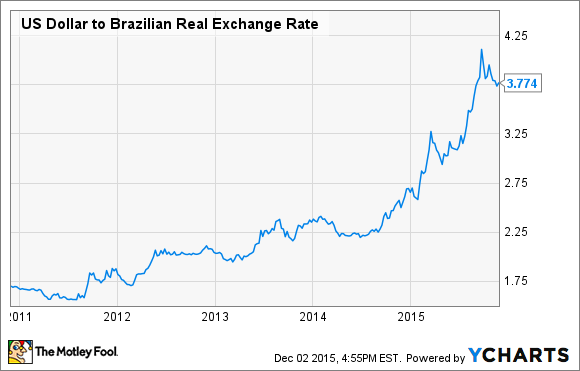 Another little help for the company has been a strengthening Brazilian real relative to the U.S. dollar. Since a large portion of the company's debt is denominated in U.S. dollars and its revenue streams are in reals, a weakening currency makes it more difficult to pay its interest and principal payments. It's a very small change, given how much the real has weakened compared with the dollar over the past five years (in the preceding chart, a higher number indicates a weakening real), but at this point any foreign exchange relief is a welcome change. Now what: These are still very small changes that might not have a huge impact on Sabesp's bottom line, but they are a welcome change to the constant flow of bad news about drought conditions and currency woes. The company is doing what it can to control what it can, such as operational costs and expanding its customer connections, but those can only go so far when Sabesp's issues are related to foreign currency and the weather.